The Creamsource Micro Colour may not be a light you are familiar with. 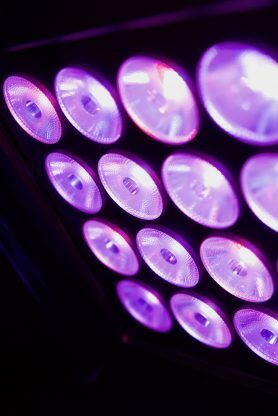 Creamsource has built a quiet reputation for making very durable, color accurate fixtures that are feature packed and competitively priced. 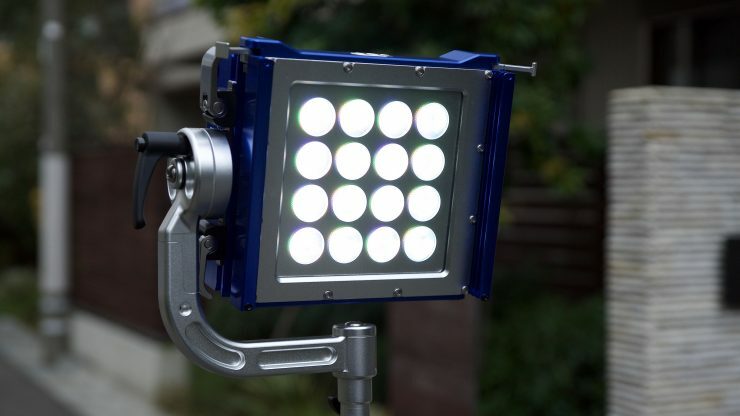 Creamsource lights have been used on feature films, such as Alien Covenant, Ghost in the Shell, Thor: Ragnarok, Rogue One: A Star Wars Story, and Aquaman. 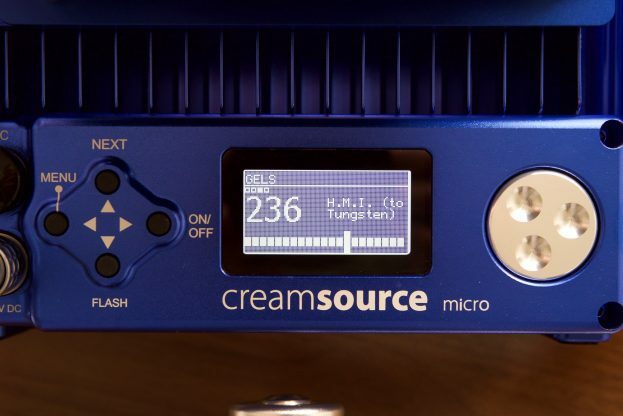 The Creamsource Micro Colour features calibrated red, green, blue and white LEDs (RGBW) which allows it to produce white light in any CCT from 2,200K to 15,000K. Yes, you read that right, 15,000K. It also has green/magenta adjustment and can produce vivid, saturated colors. The light comes in a compact form factor and has a very narrow 20-degree beam angle for maximum punch. It also utilizes fan-free cooling for silent operation and is water resistant so it can be used in all weather conditions (IP65 rated). 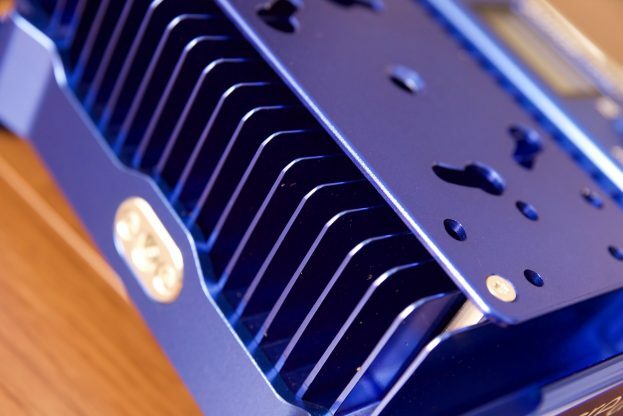 The Micro Colour comes in a rugged, quick to rig, and compact form factor. 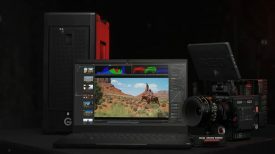 It has been designed to squeeze into small spaces on set on be run off readily available camera batteries. It’s a bit of a swiss army knife and I could see it being used for a multitude of different lighting jobs. Despite its relatively compact dimensions of 223 x 207 x 108mm / 8.7″ x 8.1″ x 4.3″ (Excluding Yoke), the Creamsource Micro Colour weighs in at 4.2kg / 9.3lb (Including Yoke). There is no way of sugar-coating the fact that this is a heavy light. I don’t think I have come across many lights that are as well built as the Creamsource Micro Colour. To say it is built like a tank is probably an understatement. The whole fixture is made out Aluminium and all of the connectors, dials, and switches are exceptionally well made. The yoke and the tightening mechanism that secures it to the light are probably one of the best I have ever seen. Creamsource haven’t cut any corners when it comes to the build quality. This is a serious light that has obviously been designed with both rental houses and field use in mind. 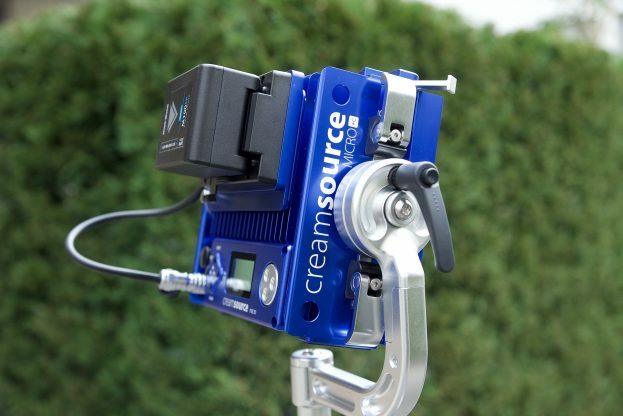 In this day and age where a lot of lights feel very cheaply made, the Creamsource certainly does stand out. That is a good question. When I asked Creamsource, they told me that that they think the Micro Colour is aimed at the same people who might buy a Litepanels Astra, BB&S Area 48, or Cineo MavX to name a few. I think the light could realistically be used by just about anyone. 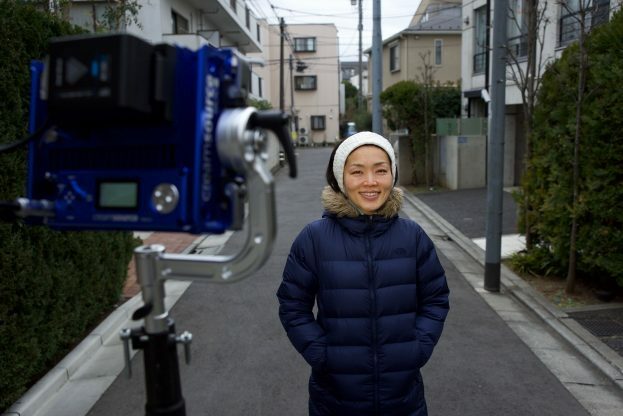 It would be just at home being used by a solo shooter as it would on a large film set. The Micro Colour runs completely silent and it doesn’t feature any fans. Instead, it uses passive cooling. As far as power is concerned, the light can handle any 10-32V DC (Max 8A ), or 100-240V AC, 50-60Hz (Max 1.3A) power input. Incredibly the light only draws 80W of power which means it can easily be run off flight safe camera batteries. 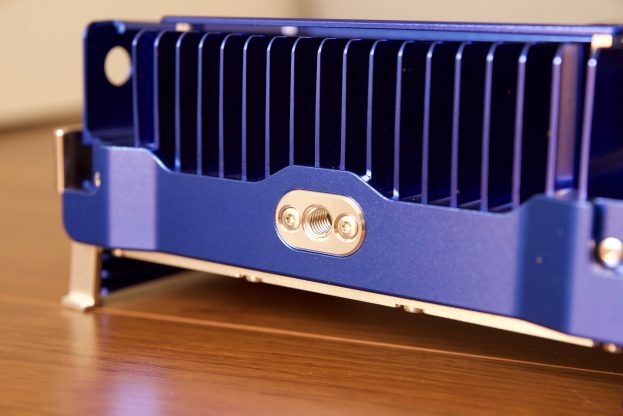 This low 80W power draw is impressive for an RGBW LED light. The light does get a little warm after extended periods of use, but it never gets too hot to touch. The light is very simple to use and it has a straight forward menu system that you can work out fairly quickly. The screen on the rear of the unit tells you all the key information you need to know. There are simple buttons for navigating the menu and a nice dial that is used for making adjustments to the output, Kelvin color temperatures etc. The Creamsource has multiple options when it comes to mounting. There are 3/8″ mounting holes on both the top and bottom of the fixture as well as the ability to use a quick release yolk system. The quick release yolk system is very good and it allows you to take the light off the yolk very quickly. It is beautifully made and almost overly engineered for a light of this size and weight. 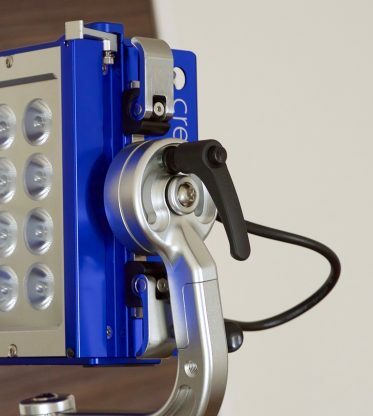 The light also takes advantage of using a Kino Flo Style Twist-on Mount on the rear of the fixture. 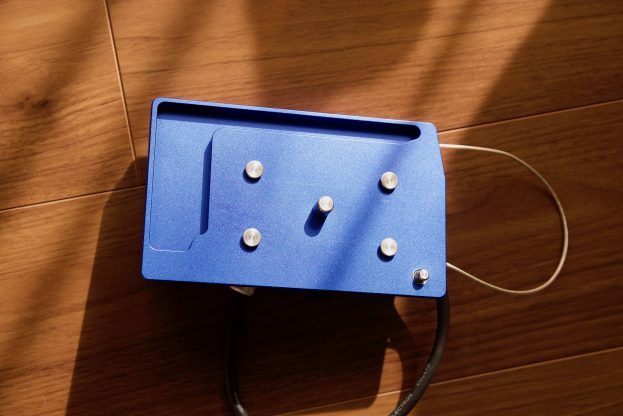 This can be used for attaching the battery plate, power supply, or any compatible yolk arm. The Battery plates are an optional extra and are available in either AB Gold Mount or V-Mount. 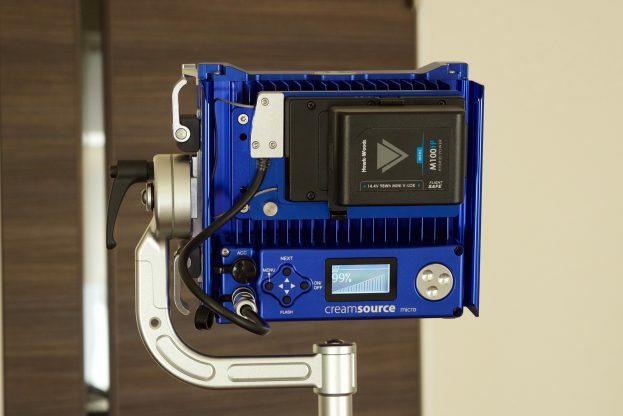 Both the battery plate and power supply can be attached to the Creamsource Micro Colour or placed on the ground, or attached to a light stand. 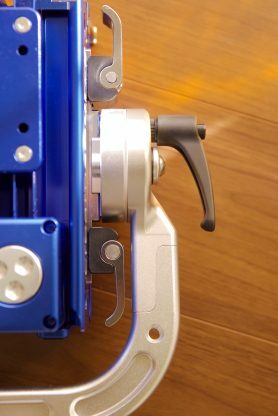 Both the battery plate and the power supply have the Kino Flo Style Twist-on Mount plate on the back and they also feature a wire loop so you can hook them around a light stand. In this mode, you can adjust the Kelvin color temperature, output, and green/magenta offset. Color HSV mode lets you adjust Hue and Saturation independently. This mode lets you independantly adjust Red, Green, Blue, and White light. Color XY allows you to adjust both the X and Y axis to custom dial in colors that you want to create. The Creamsource Micro Color offers green/magenta CC adjustment. This is very handy if you are using the fixture with different lights and you want to try and get them to match more closely. 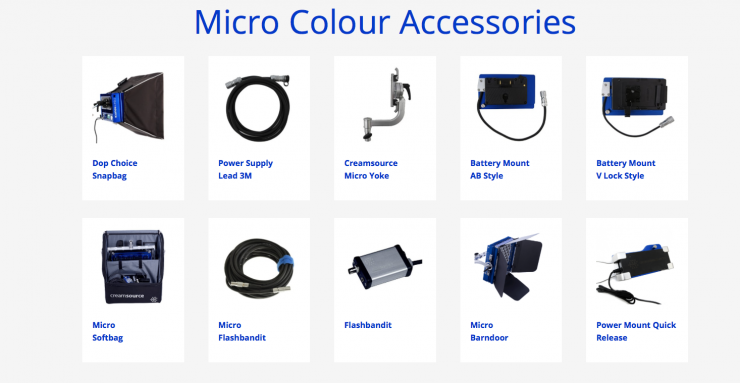 The Ceamsource Micro Colour has a very impressive CCT range of 2200 – 15000K. This is the widest CCT range of any light I have ever tested. The ability to create light throughout that wide CCT range makes the Micro Colour very versatile. 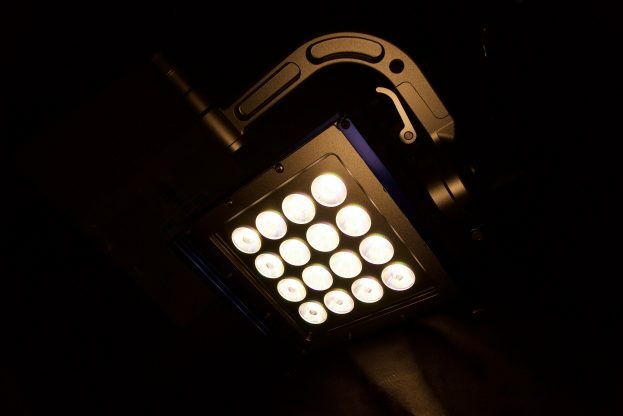 The fixture has a ton of in-built filters that can be used for altering the appearance of the light or creating unique looks. 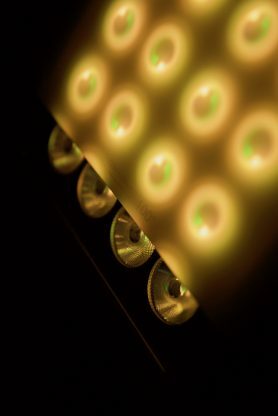 Just like so many other lights on the market, the Creamsource features a range of special effects that you can to create interesting lighting. 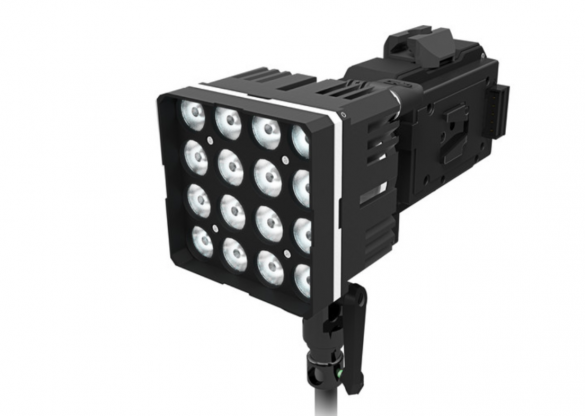 The light provides a flicker-free operation to more than 5,000fps when using a High-Speed Mode. 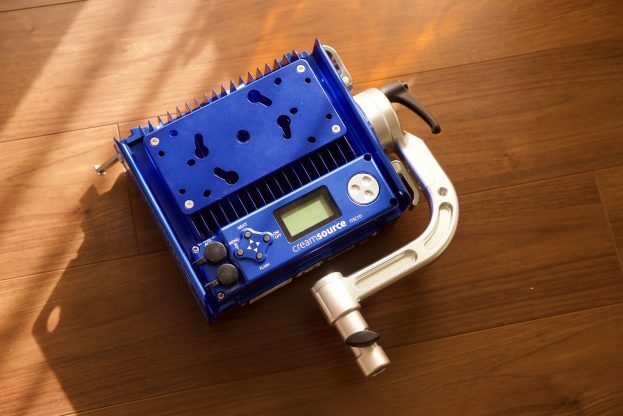 A trigger input can be connected from the light to the camera shutter for flashing and strobe effects if you purchase the optional $495 USD Flashbandit sync box. In a nice touch, you can store up to 20 User Presets inside the fixture. This is very handy for accessing specific lighting effects, filters or Kelvin color temperatures you use on a more frequent basis. There is a range of optional Holographic Lenses that are available for the Creamsource Micro Colour. Made from laser-etched lens material, there is a 20-Degree Medium-Spot, 60-degree Medium-Wide, and 100-degree Extra-Wide Holographic Lenses available. They drop into the filter rail on the front of the fixture and they expand the Micro’s beam spread. 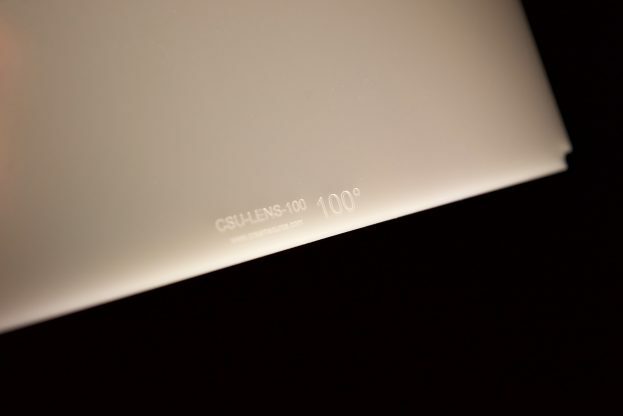 The company claims that unlike diffusion material, the lens softens the light quality while transmitting 90% of the fixture’s output. These Holographic Lenses are extremely useful and dramatically increase the versatility of the fixture. 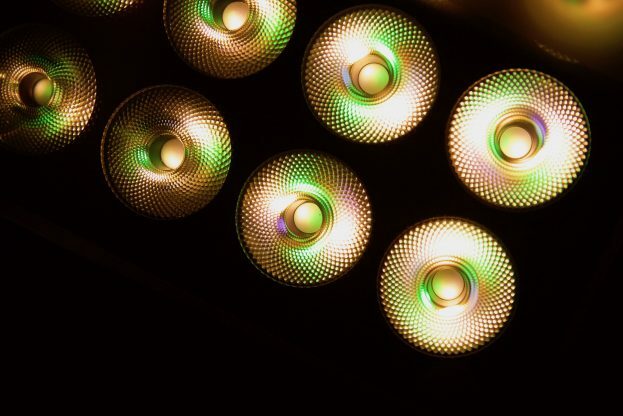 A big factor for a lot of people when buying a light is how much output it can produce. I tested the lights output at a variety of Kelvin color temperatures using a Sekonic C-700 at a distance of 1m (3.28ft) in a controlled environment; you can see the results below. At 3200K the Creamsource Micro Colour recorded an output of 14,400 lux (1380 fc) at a distance of 1 meter. This was a very high output, but you do need to remember it has a very narrow 20-degree beam angle. 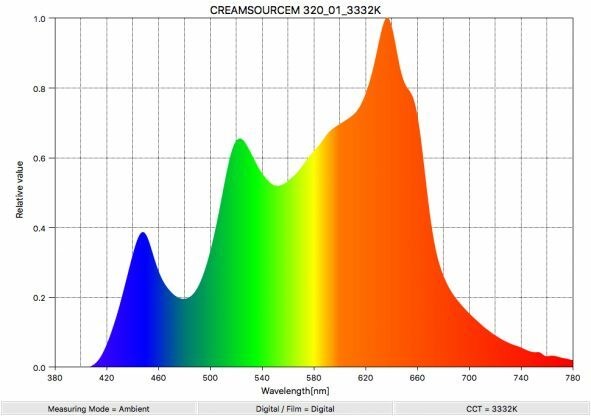 The output of 14,440 lux exceeded the 12,900 lux that Creamsource officially lists for the Micro Colour when used at 3200K. At 5600K it recorded an output of 14,400 lux (1380 fc), which was absolutely identical to the light outputs when used at 3200K. 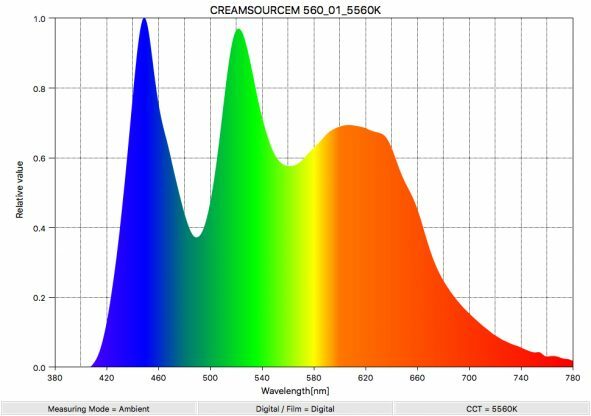 It’s usually very common for any LED light to have a greater output at 5600K than at 3200K as it takes less energy to generate an LED that is in the blue part of the spectrum, but Creamsource bucks that trend. The figure of 14,400 lux was again good. 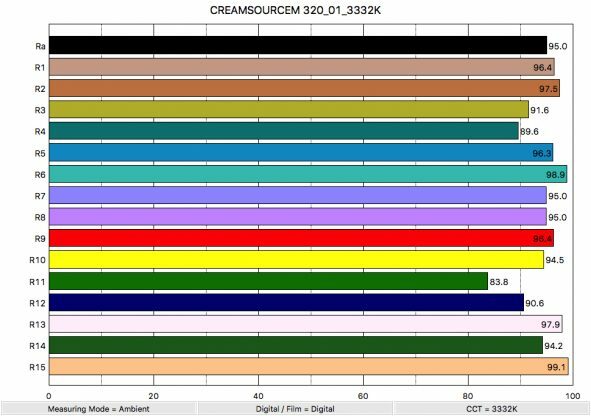 These results show me that the Creamsource Micro Colour is able to put out a very consistent output regardless of what Kelvin color temperature it is being used at. The results showed me just how much output you lose as the beam angle widens. This is important to remember if you plan on using the fixture to create a wide source of light. I decided I would also test the lights output using the diffusion panel. Above you can see that at 5600K the light recorded an output of just 969 lux (90 fc). 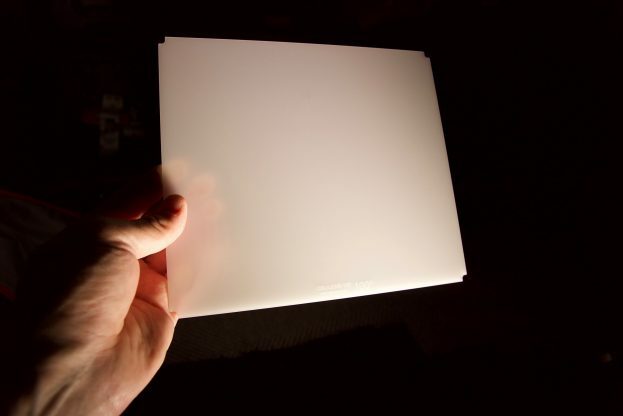 This diffusion panel is obviously very strong because it reduced the lights output by a whopping 93.29%. The light is pretty good when it comes to accurately replicate Kelvin color temperatures. As far as color temperature accuracy is concerned, the Creamsource Micro Colour, when set at 5600K, gave me a kelvin reading of 5560K and a ⊿uv (the value to show how much this light is away from being an ideal light source) of -0.0035. This was almost spot on for replicating 5600K light. At 3200K it recorded 3332K and a ⊿uv of -0.0028. As you can see the light does have a push towards magenta. Overall, these are pretty good results and give you peace of mind that when you set the light at a certain color temperature, that’s the color temperature you’re actually going to get. I wanted to try out the Tint Control ± G/M Adjustment to see how well it worked. There isn’t really an exact science to this and you can’t just dial in -0.3G if the reading you get was +0.3M, to get a CC score of 0, it just doesn’t work that way. It really is a case of just adding and subtracting until you get it right. 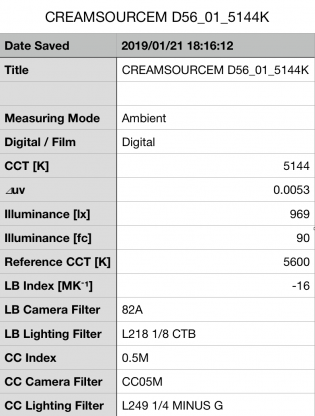 As the Creamsource Micro Colour recorded a CC Index of 0.2M when used at 5600K I found that if I dialed in -0.06 using the tint control I was able to take the magenta out of the fixture and achieve a perfect 0.0 CC score. Now, in saying this, getting a perfect score on a Spectrometer is one thing, but that doesn’t necessarily mean the light is going to look better. The real purpose of the Tint Control ± G/M Adjustment is so that it is easier to match other lights that you may be using. After testing the output and color temperature accuracy I then wanted to test the Creamsource Micro Colour for color accuracy. Below you can see the results for the light at 3200K. At 3200K the light recorded an average CRI (R1-R8) of 95.0 and an extended CRI (R1-R15) of 94.45. As far as replicating accurate skin tones the light recorded 96.4 for R9 (red), 97.9 for R13 (closest to caucasian skin tones), and 99.1 for R15 (closest to Asian skin tones). The score for R11 (green) was a little lower than I would have expected, but the overall results for proper skin tone reproduction were exceptionally good. When I tested the light at 5600K the scores were not quite as good as those at 3200K. At 5600K it had an average CRI (R1-R8) of 95.3, and an extended CRI (R1-R15) of 93.52. For replicating accurate skin tones it recorded 90.1 for R9 (red), 98.7 for R13 (closest to caucasian skin tones), and 98.6 for R15 (closest to Asian skin tones). These were excellent results, but, the light seems to have a slight problem with R11 (green), and R12 (blue). I tested the light by shooting a color checker chart and didn’t find that this lower score for R11 or R12 made any noticeable real world difference at all. 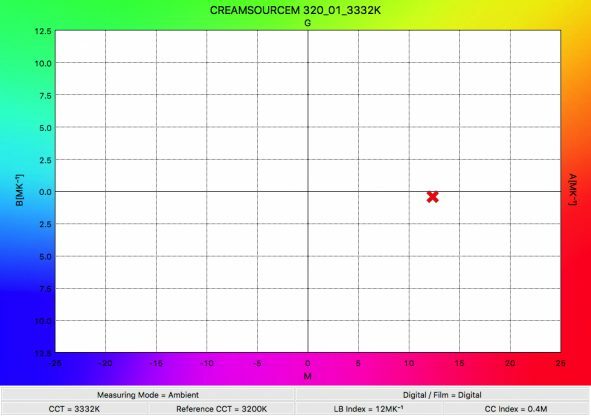 Above you can see the Creamsource Mini Colour’s spectral distribution when used at 3200K. While the light does have a nice full spectrum it certainly has both blue and green spikes. 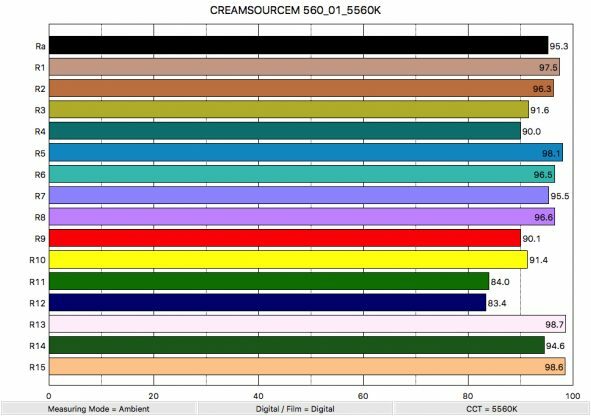 Above you can see the Creamsource Mini Colour’s spectral distribution when used at 5600K. The light certainly has a very full-color spectrum, but it has a very pronounced green spike. As I always say, photometric scores only tell you part of the story. Just because a light scores well doesn’t necessarily mean the light will look good. 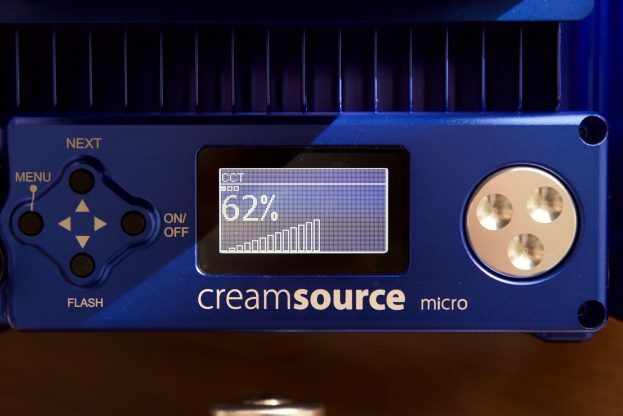 So do the scores from the Creamsource Micro Colour translate into real-world performance? I found from my limited time using the light that is produced really nice results. I especially liked the versatility of the fixture and I found myself using it quite often as a backlight for sit down interviews. The narrow beam angle gives the light a lot of control. I also like that you can change the beam angle of the fixture using the holographic lenses. This greatly expands the lights usability, as you can turn the fixture into whatever you need it to be. The Micro Colour can certainly be used as a key as well, but in saying that, it only really works in you are using diffusion. As far as color is concerned, it does a very nice job of accurately replicating skin tones. While the Spectral Response does show a pretty pronounced green spike, it didn’t seem to be affecting real-world performance. The fact that the light has a green/magenta offset, means you can actually dial in any corrections you feel that need to be made. Even though the light can be used to create a wider beam spread, that will come at the expense of output. If you want to use the optional 100-degree holographic lens, for instance, you shouldn’t expect it will be able to light up larger areas. As the light can also be run off a single flight safe camera battery I wanted to see how suitable it was for use outdoors. 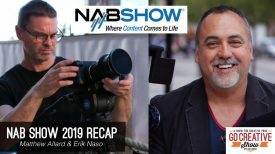 If you working in news or any sort of EFP environment there is always going to be times where you will need to shoot your talent outdoors in a situation that will require a light. I found that although the Creamsource has a fairly bright output, the beam spread is fairly narrow. For the example above the light was set at 5600K and 100% output. It was placed 1.5 meters away from the subject. While it certainly has enough output to help light up a subjects face, you need to remember that it is pretty spotty and it may not give you the desired effect you are after. The light is certainly capable of filling in faces, but it is not going to be strong enough to match a very bright background. The thing you need to take into account is that the light without diffusion is very bright for your talent to look at, but I found if they are looking to the side of the light and not directly at it, it’s very usable and not uncomfortable for the talent. I also tried using the 20-degree holographic lens to see how it looked outdoors. I found it worked well, but as it reduces the output quite dramatically, I had to move the light a lot closer to my talent. As I have mentioned in other lighting reviews, the numbers only tell part of the story. You can have the most color accurate light in the world, but if it is difficult to use and operate then you are going to leave it at home. The Creamsource is very straightforward and easy to use. Whoever designed the fixture must have been a gaffer. Every element of the design and operation has been thought out with practicality and ease of use in mind. I don’t like lights that take too long to set up. I prefer lights that you can take out of a case, throw a battery on the back and turn on. If you are a solo operator time is always crucial. There is nothing worse than taking 5-10 minutes to set up a light before you can turn it on. 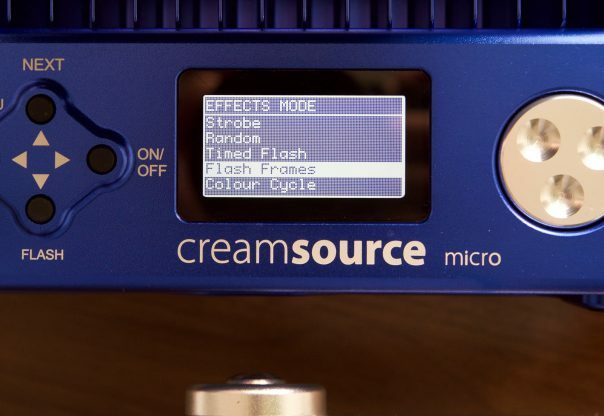 The Creamsource Micro Colour is a light you can take out of a case and use very quickly. I’m not the biggest fan of lights that consist of multiple components. I prefer all-in-one lights that I don’t need to build up. What I love about the Creamsource is the Kino Flo style twist-on mount. 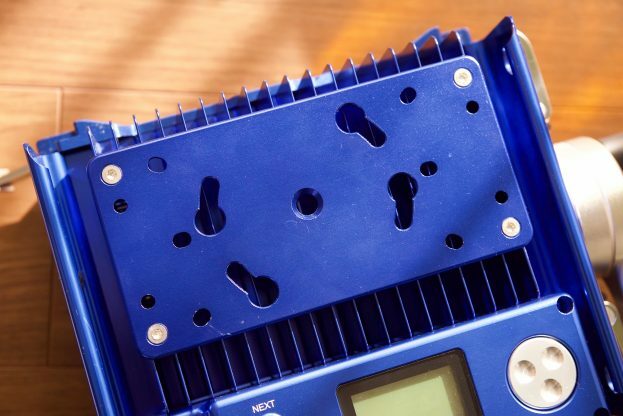 This allows you to quickly swap between the mains power supply and the battery plate. 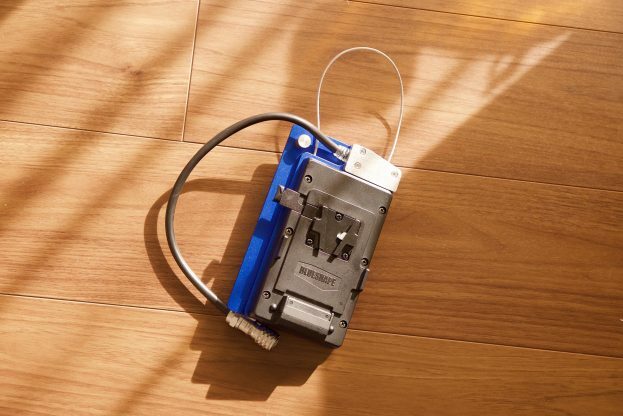 In a smart design move, Creamsource lets you keep the battery plate on and still connect up the mains power by placing it on the floor or hanging it off a light stand. You can also do the reverse and have the mains power attached to the fixture and leave the battery plate on the floor or hang it off a light stand. The quick release yolk bracket is another fantastic addition and it allows you to remove the yolk assembly in seconds. You do need to take into consideration that the Micro Yoke is an optional extra. As far as using the lights controls, making changes to the output and color temperature are very straightforward and the LCD display lets you accurately monitor and see any changes that you make. Controlling some of the other features is also fairly easy, but like any new product, it will take time to develop an intricate knowledge of how everything works. 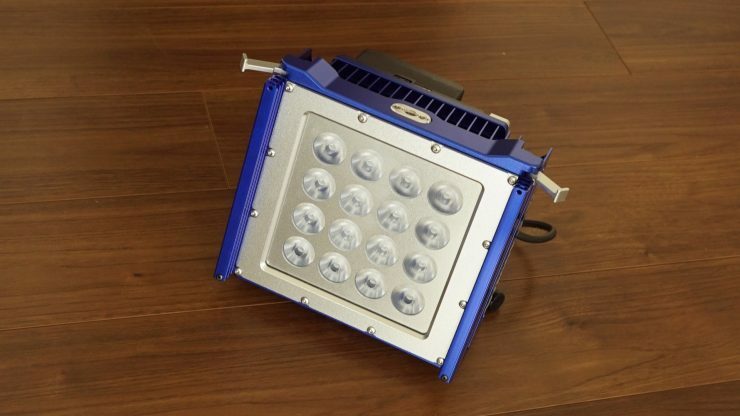 The low 80W power draw is very advantageous if you want to use the light in the field. Having the ability to run it off flight safe camera batteries adds to the convenience factor. I love that you can just drop in optional diffusion panels that increase the lights beam spread. Again (I’m sounding like a broken record), Creamsource have really thought about versatility and usability. 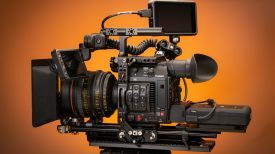 Despite its weight, the lights compact form factor, versatility, and low power draw make it a very viable option for a traveling shooter. I would definitely travel with this light because I could use it for so many different applications. The light fits inside a Pelican Storm case IM2450 with room for all the accessories you would need. I weighed in the Creamsource Micro Colour, battery plate, power supply, diffusion panels and the Pelican case at 10.3 kg (22.7 lb). 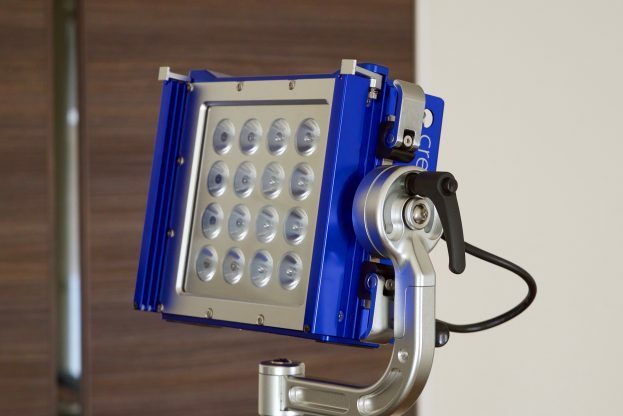 I think that the direct competition probably comes in the form of the Digital Sputnik DS 1 LED Light Modular System. 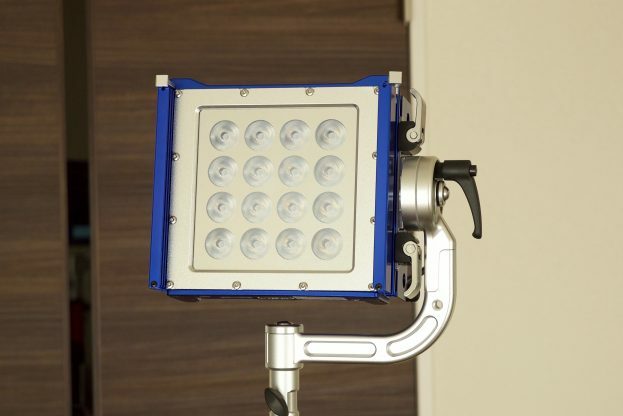 It uses an RGBW LED module which provides color temperature adjustment from 1500-10,000K as well as full-color control, including primary color rendering. This single light system can also be expanded with ease to add more light. The fixture offers a focused beam angle of 20° along with flicker-free dimming from 0-100%. Users can control the light using local controls and an OLED screen. Also, the light can be run off of batteries using a dual V-mount battery plate setup on the PSU, or it can be powered by a 90-260 VAC adapter. The light also features built-in Wi-Fi and DMX for remote control. The light weighs in at 1.3 kg (2.8 lb) which makes it considerably lighter than the Creamsource. It is also a lot smaller with dimensions of 4.0 x 4.0″ / 116.0 x 116.0 mm. The Digital Sputnik DS 1 LED Light Modular System retails for $2,500 USD. While on the surface, the price of the Basic kit looks to be good value, you need to factor in the cost of all of the accessories you are going to need. At a minimum, I think a lot of shooters would want the Yolk Mount, a battery plate, and a couple of the Holographic Lenses. If you add these items, your Basic kit which cost $1,295 USD suddenly becomes $1,923 USD. Does the Creamsource Micro Colour represent good value for money? That is a hard question to answer. 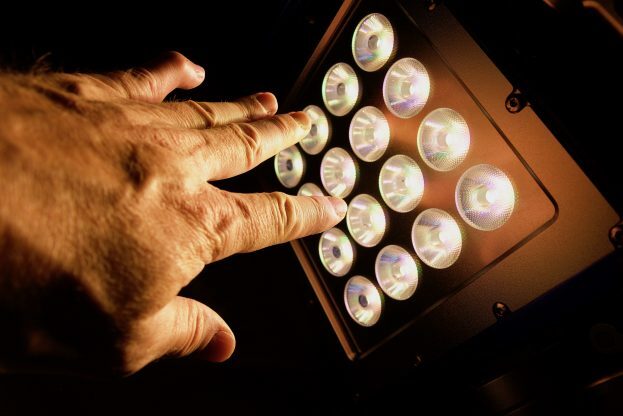 There is certainly no doubt that the light is built tough, well designed, feature packed, and has good photometric scores, but does that justify the price tag? Personally, I think the light is reasonably priced for what it is, but I don’t like when companies make key components optional extras. It’s fair to say that not many people are going to purchase the basic kit and not get a battery plate, yolk, or any of the Holographic Lenses. 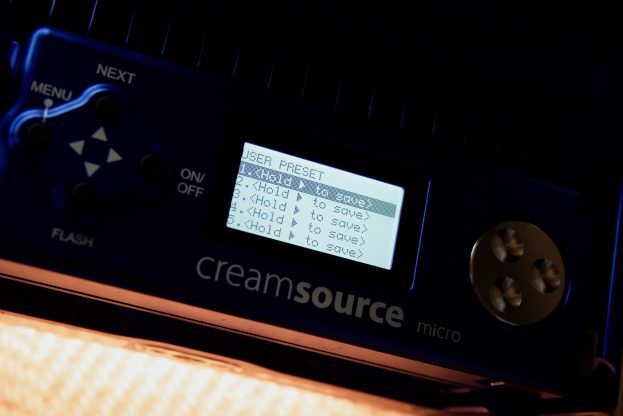 The Creamsource Micro Colour is probably one of the best-built lights I have ever reviewed. It also offers a lot of versatility and comes equipped with a ton of features. It has a good output for its size and its photometric scores are very good. The fixture can be anything you want it to be. You could use it as a key light, a backlight, a fill light, a background light, or just about anything else you can think of. 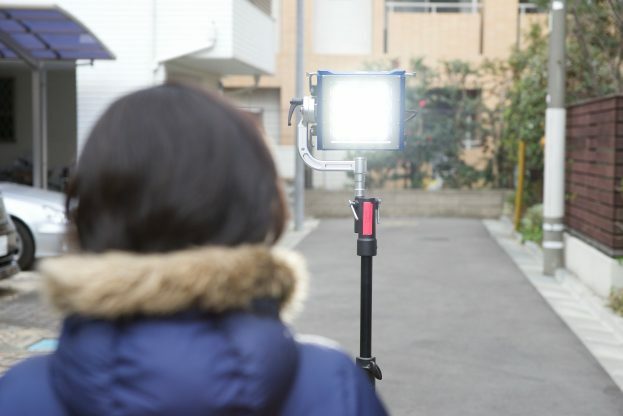 The ability to run the light off a camera battery makes it an intriguing light if you are looking for a multi-versatile, travel-friendly fixture. The light is color accurate and very good at replicating skin tones correctly. It is also excellent at reproducing the correct color temperature across its entire Kelvin color temperature range. The ability to change its beam angle is also something that shouldn’t be overlooked. To be honest, I really didn’t know what to expect from the Creamsource Micro Colour. I originally had my doubts as to how useful a light of this size would actually be, but I soon found myself using it for a lot of my lighting setups. It does come at a cost though. The fixture isn’t that expensive, but once you factor in all of the optional accessories you need to buy it does start to add up. 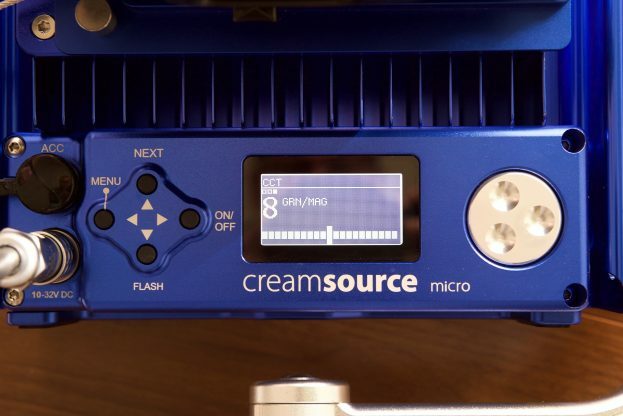 With good functionality, color accuracy, and a nice quality of light, the Creamsource Micro Colour is a nice addition to anyone’s lighting arsenal.